← South Shore By Any Other Name Is Still…. Proposed site for Berkeley Lab 2nd Campus is to the left of parkland trees. As the city begins its final phase of taking stock and reassessing its vision for Alameda Point, we’ve been presented with the opportunity of a lifetime. The Lawrence Berkeley National Laboratory is considering locating a new second campus at Alameda Point. It’s one “new idea” that has Alamedans excited and united. The Lawrence Berkeley Lab should not be confused with the Lawrence Livermore Lab. Unlike the Livermore Lab, which focuses on security issues, the Berkeley Lab conducts unclassified research on solving global problems in human health, technology, energy, and the environment. Researchers at the Berkeley Lab have revealed secrets of the human genome, revolutionized the field of medical imaging, redefined the causes of breast cancer, explained photosynthesis, developed a device to kill water-borne diseases, exposed the risk of radon, and helped make appliances and windows more energy efficient. 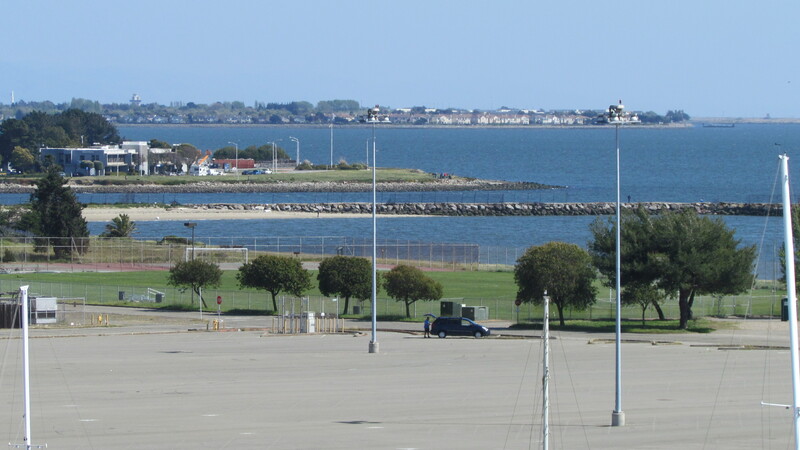 The city is proposing that the new campus be built on land across from the maritime ships near the soon to be built, state of the art ferry maintenance facility and future regional park. The 45-acre site is in a highly desirable area with federal, state and regional interest. The Lab is a good fit with the current tenants at Alameda Point and could be a catalyst for future Point development. From hotels to eateries, nearby Webster Street and Marina Village have every amenity the Lab would need, and plans for improving Webster Street are in motion. The Lab’s campus would compliment Alameda’s existing green image and provide a welcome addition to our community. The Lab is considering other locations, weighing its options and looking to see if Alamedans would welcome their second campus. City leaders are doing their part by offering the land for free, listing a catalog of incentives, putting together a building and land development team for the Lab, and collecting letters from organizations and residents to show that Alameda strongly supports the Lab coming to the Point. The city submitted its proposal to the Lab on March 4. The Lab anticipates compiling its short list of sites in April and making their final selection in June. The general manager of Alameda Municipal Power (AMP) stated confidently at a recent meeting that AMP is fully capable of handling the Lab’s load requirements and that he is confident Alameda will be on the shortlist. Everything counts in this intense competition for the new Lab campus. Add your voice. Send letters voicing your support to Alameda’s Deputy City Manager Jennifer Ott at City Hall, 2263 Santa Clara Avenue, Alameda, CA 94501. An opportunity like this won’t come along again anytime soon. More info available at Bring Berkeley Lab 2 Alameda Point. This entry was posted in Alameda Point, Economic Development and tagged Alameda Point, Berkeley Lab. Bookmark the permalink.